Rhyming Riddles Set - work on schema AND rhyming with these pictures and clues! 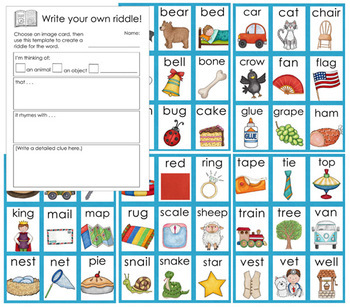 is a great way to work on rhyming practice, as well as teach about schema. 1 to a page, and 2 to a page. 2. The same 30 images and riddles, with images and riddles printed separately. This allows students to work at a center to match up the riddles with the appropriate image. 2 to a page format. 3. 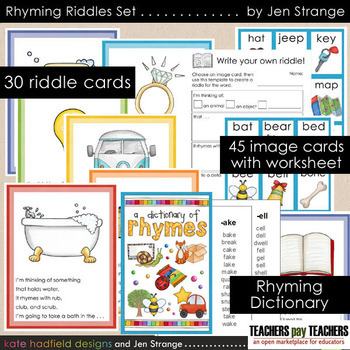 45 wallet-sized image cards and accompanying worksheet for students to choose an image and write their own riddles. 4. Dictionary of Rhymes containing all the rimes from the 45 images, to assist in riddle writing. 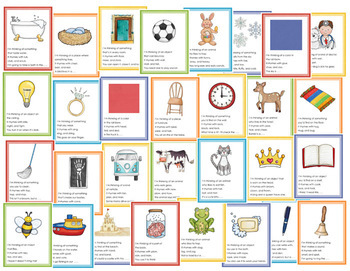 These cards give students a chance to activate their prior knowledge / think about their schema for something like “furniture” or “animals,” then gradually narrow down the possibilities, given the clues. The clues for the teacher to read start simple, and extra clues are provided for those who are stumped. 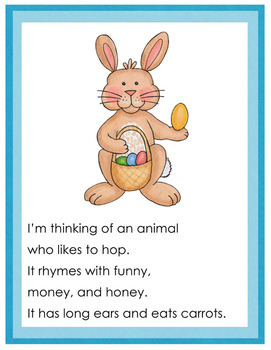 For example, with this bunny card. First you would say, “I’m thinking of an animal,” then pause for a second for kids to register “Ok, animal.” Then say “who likes to hop.” Students will start to think of the possibilities for a hopping animal. Then say “It rhymes with funny . . . “ and pause for a second to see if someone knows just from this. Then continue with the other rhymes, and wait. If they still don’t know, then you read the last line, which has a fairly specific clue. Once they guess, or if they’re completely stumped, turn the card around for everyone to see the image. Please note that this is a stand-alone set and is not included in the Rhyming Games and Activities set.